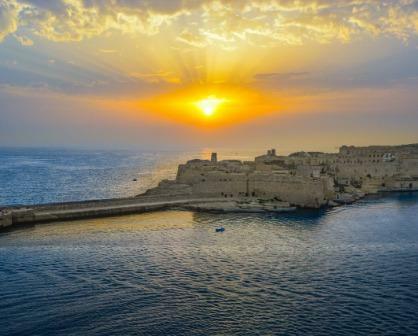 When planning for upcoming summer adventures, many travellers consider booking flights to one of the hottest destinations for digital nomads this year, the Republic of Malta. However, a frequently asked question arises when it comes to searching for this specific route: how many airports are there in Malta? Located in its capital city, Valetta, Malta has just one international airport, which functions as gateway for visitors into the main island as well as into Comino and Gozo. Actually, these two smaller pieces of paradise have a heliport each, but travellers tend to use ferry boats and water taxis instead, which are quite affordable and do not take long to arrive, to get to the Maltese islands. Malta airport has one passenger terminal building only, which serves as operational base for Air Malta and Medavia in the country and accommodates a varied array of passenger services, shops, cafés and restaurants –both on the landside and the airside-, a VIP lounge, conference facilities for business travellers, an observation deck for aviation geeks and enthusiasts, several charging stations for electronic devices across the premises and a high-speed WiFi network accessible at no charge. If you are looking for flights to Malta, know that some of the main international airlines operating routes within Europe and abroad offer seats to travel to Valetta airport seasonally as well as regularly. Among the carriers covering routes from European cities to Malta all year round we count Air Malta, Alitalia, British Airways, Easyjet, Emirates, Jet2.com, Lufthansa, Qatar Airways, Ryanair, Scandinavian Airlines, Tui Fly, Turkish Airlines, Vueling and Wizz Air. Provided that your airline of choice is not included in the previous list, there is a possibility that it offers flights to Malta on a seasonal basis as is the case with Aegean Airlines, Luxair, Finnair, Swiss International Airlines, Iberia Express, Thomas Cook, Atlantic Airways, Czech Airlines, Air Serbia and Transavia. When trying to find the best way to travel from the airport to your hotel in Malta, travellers have several means put at their disposal. Firstly, there are four different express bus routes departing from the airport terminal to strategic points in the island: these routes are X1, X2, X3 and X4. Travelling by bus from Malta airport is considered one of the cheapest and most convenient ways to do so, plus buses boast spacious luggage compartments so that you do not experience any issues regardless of how many bags you are carrying. Nevertheless, if you find out that the bus won’t take you close to your accommodation, you can always arrange a shuttle service either online or at the tourist office in the Welcomers Hall of the airport upon arrival. For greater independence, taxis in Malta airport run services 24 hours a day and, despite this might be a slightly more expensive commute, pre-paid tickets for a flat prefixed fare according to the destination of your journey can be purchased at the Welcomers Hall. As an alternative, and as could not be otherwise, there are also car rental offices in the Arrivals area of the terminal. The most popular means of transportation for travellers commuting from Malta to Gozo, from Malta to Comino or even between the small islands are ferry boats and water taxis. Journeys take about 30 minutes on average and, in order to take a ferry to Gozo or Comino, you must go to the Ferry Terminal in Valetta first, although some services also depart from Cirkewwa and other points in the island. In many cases, you will be able to take your car with you to get around the Maltese islands. You are advised to head over to the Tourist Information office in Malta airport, found on the Welcomers Hall, as they will inform you of the most reliable ways to get to the ferries to Comino and Gozo and how to purchase your tickets. Next What is the ETIAS travel authorisation and who needs it?